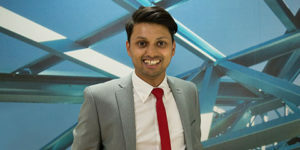 To prepare you for your first moments at Northumbria University London Campus, we spoke to Walieur Rahman – our London Campus Manager. Here is the inside track to learn more about your first week at our busy, sociable learning environment in central London. Can you explain what your role at Northumbria University London Campus includes? Essentially, I make sure that students get the support they require when they arrive on campus. I manage the operational staff to ensure that everything runs smoothly, from the IT equipment through to events on campus. The first 2 weeks of each intake are typically our busiest; last September was the biggest intake we’ve ever had, with over 250 new students enrolling. That is a lot! What else has changed on campus recently? The popularity of the courses has spread into new parts of the world. We now teach the most diverse set of students we have ever had, with lots of different nationalities now enrolled at the London Campus. It certainly makes the place feel very lively. It has also enabled us to invest in brand new technology for the classrooms as well as a vastly improved common area, which is the perfect place for students to eat, relax and socialise. What can students expect when they arrive on their first day? All students will have an opportunity to meet each other as Dr Guy Brown, the Campus Director, introduces the University and its London Campus. This is a great opportunity to ask him some questions, as he oversees all student activity in London. He will be your point of contact for important matters if they arise during your time studying with us, and some students may even get taught by him at some point during their semester. After that, I then introduce everyone to the professional support team, consisting of around 4 people that you are likely to see day-in, day-out. I will also talk through some of the really basic but important systems and processes that will make your life on campus comfortable – like IT and access to different online databases to help you study. For example, we have an e-learning solution called Nora, and it’s really important that people learn how to use this right from the start of their course. When do students get to meet their classmates and course leaders? Once everyone has been welcomed together, you will have a programme induction where you’ll join classmates to meet the academic lead for your course – as well as the people you will share your studies with. This is an in-depth introduction to the course, which will take between 5 – 6 hours. My recommendation: make sure you take notes! It’s really important that everyone gets all the important information they need upfront. Then the fun begins. Our team arranges a great student social to get everyone off campus and integrating with each other. The campus is surrounded by great bars, restaurants and shops – so there is plenty to do and see when we all go out. Last intake, all the new students went to Pizza Union and then to a bar afterwards – this is the best opportunity to familiarise yourself with the students and support staff. It’s great to see everyone make new friends at these events every year. What else can people do when they start? The Students Union fair is something to put in the diary. The campus has a Northumbria University Students Union representative, and they organise this event to help people understand more about how the Union operates. If students choose to use this range of services, they can benefit from university partnerships with bars and restaurants – as well as access to different events. Finally, what is the best piece of advice you can give a new student? Arrive with an open mind. There are many different types of people studying here, and London is one of the most diverse places on the planet. Approaching your time here with an open mind will enable you to make the most of it. This is an exciting time to be on campus in London and we’re looking forward to our next intake.